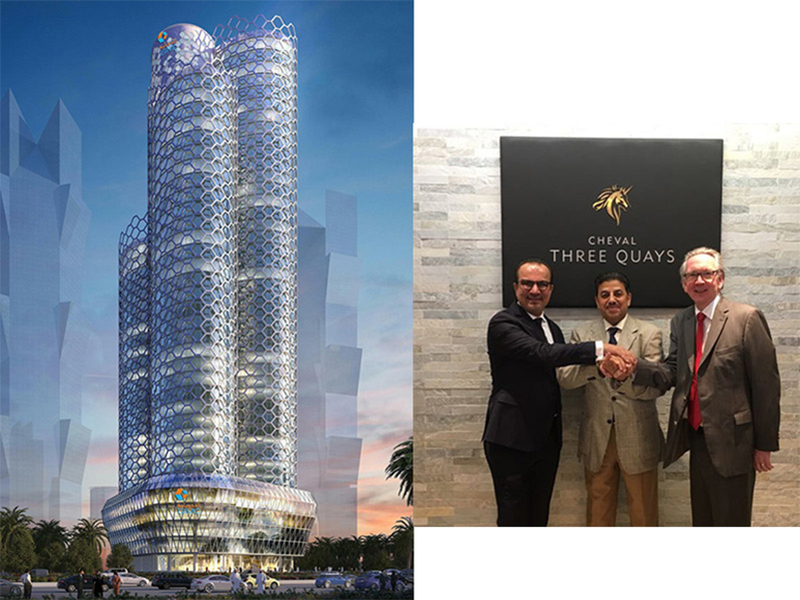 Luxury serviced apartment specialist Cheval Residences has announced it will be opening luxury serviced apartments in Doha Qatar in 2020, following an agreement signed between Cheval Residences and Qatar Industrial Manufacturing Company (QIMC). Cheval West Bay ApartHotel, Doha will offer breath-taking views over the sea and city and will be close to the central business district and the Doha Exhibition Centre. Each will be furnished to the very highest standards with floor-to-ceiling windows for guests to take in the spectacular sea and city views, sleek marble and wood luxury finishes, top-of-the-range audio-visual equipment, rainforest showers and modern kitchens. Guests staying at Cheval West Bay ApartHotel, Doha will also be able to take advantage of exclusive use of a gym, spa, outdoor swimming pools and an array of restaurant and fine dining experiences in the building. For any questions or more information please email: Doha@chevalresidences.com. Cheval Residences currently offers a beautiful collection of serviced apartments, townhouses and penthouses in some of London’s most desirable addresses; Cheval Gloucester Park, Cheval Thorney Court, Cheval Knightsbridge, Cheval Calico House, Cheval Harrington Court, Cheval Hyde Park Gate, Cheval Phoenix House and Cheval Three Quays. Each of the eight residences has its’ own individual style, yet all share the same ethos and levels of service rarely enjoyed outside the world’s finest hotels. The apartments vary from an elegant open plan one-bedroom apartment to a spacious four-bedroom penthouse. Cheval Residences was awarded ‘Best Villa or Serviced Apartment’ at the 2017 Condé Nast Johansens Annual Awards for Excellence. Qatar Industrial Manufacturing Co. QIMC started business in May 1990 only to become within a short period of time one of the pioneering companies in the field in Qatar. QIMC’s initial authorized capital was set at US $ 55 Million. In 2014, capital was increased to US $ 131 Million. Far from being confirmed to the State of Qatar, QIMC’s activities extended to other GCC counties such as Saudi Arabia, Bahrain and Oman.